Native CTI integration for the STARFACE PBX. Is there a better alternative to STARFACE Client? Is STARFACE Client really the best app in Applications category? Will STARFACE Client work good on macOS 10.13.4? STARFACE Client is a native CTI integration for the STARFACE PBX. Initiate phone calls and faxes right from your Desktop. About STARFACE: STARFACE is a professional telephone system as software solution or appliance for small and medium-sized businesses with up to 500 extensions. STARFACE excels in usability and flexibility, and features conference rooms, Music-On-Hold, call forwarding, Call-Through, call queues, fax-to-mail or software fax and CTI for virtually every CRM system from Outlook to Salesforce. Read more about STARFACE at http://starface-pbx.com. High-resolution graphics for Macs with Retina display. The application is signed with our developer ID. Messages are also displayed in the message center. Outgoing calls can be canceled (via the Red handset icon). 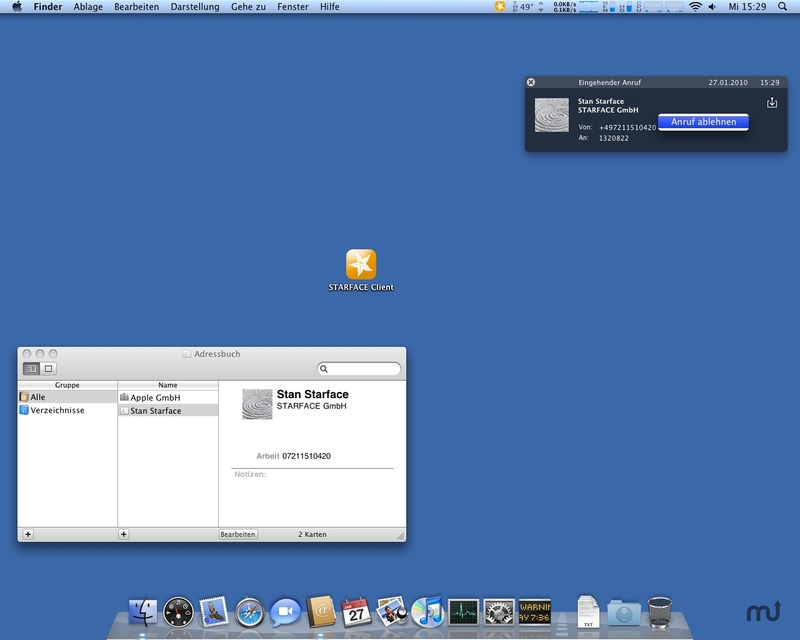 Background of the call window is displayed correctly on the latest versions of OS X.
STARFACE Client needs a review. Be the first to review this app and get the discussion started! STARFACE Client needs a rating. Be the first to rate this app and get the discussion started! The fax printer driver is automatically installed on the current versions of OS X correctly added to the printer subsystem (system reboot after installation is no longer necessary). Improved error handling on timeout when connecting to the server and when broken connection to the background process. The search field in the Call List window will now reset when the selection changes in the sidebar. Various settings are now considered reliable. Therefore, the client's behavior may change by the update. In this case, please check if the settings match the requirements.